As posted earlier; moved to Hoschton, Georgia to be closer to the children who live in the Atlanta area! One of the gifts of getting older is the recognition that every day is a gift and blessing and you should begin the day with a grateful heart. What a wonderful time; to look back in your memories and see all the fantastic people who have crossed your path. The people in your youth who had faith in you and helped guide your journey. The friends from long ago that still when you think of them makes your heart happy. The things you achieved; but in your youth seemed out of reach and never to be. Looking back and seeing that you were loved and that God had been with you the entire journey even when you thought he wasn't! Much love to all; Peace and most of all thank you! Thank you for crossing my path. 2015----Now in Georgia; about 45 miles NW Atlanta in the foothills of the GA. Mountains. Our children live in Atlanta and wanted us to be closer "your getting older dad and mom" you need to be closer Ha! So we moved. (past tense) Now back in Florida. Although I moved back to the Texas area from Florida in 2007 for "a job". 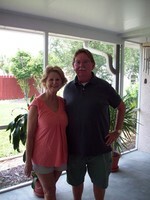 My wife and I still kept our home in Florida, it was a great two years but it is great to be home. I am greatful that I spent the last 2 years in Texas. I had the opportunity to renew loving relationships with family that I had not had in almost 40 years because of moving around the county. For many of my remaining family members, this period is near the end of their earthly life, and what a blessing it has been to become close and experience their love and memories. As our children live in the Atlanta area we will be closer now that we live in Florida and will still focus over the next several years to find our place in the north Georgia mountains. I married in 1970 to a girl that I met on a blind date in the Hartford Conn. train station in 1969. She worked for National Airlines in NYC. We have moved all over the southern part of the US. This was our 3rd time in the Houston, Texas area. In 2005, I was through Roswell with my mother and her brother. She had been ill and I took them on a road trip to see her sister. She passed later that year. That was the only time I had been back in almost 40 years. Not really a school story; either in late 2007 or early 2008, I was at a meeting in Austin and was chatting with those attending. One "older gentleman" and I were discussing that we were both raised in NM, I said I was raised in Roswell and he said likewise, I told him that I graduated in 1964 and he said likewise. It was Bill Tarro....needless to say..I think both of us were surprised. Years ago in Houston, I worked for the same company as Mike Waller (1964). I got on the elevator one day to head to lunch and there he was..what a shock for us both. He was a computer guy and I ran benefits for the same oil company. He and I got together from time to time and I believe he still lives in the Houston area. Merle Freyer(1964) was I believe a sister-in-law to Waller and lived in Houston as well. I believe she was a school teacher. Darrell Barnes has a birthday today. 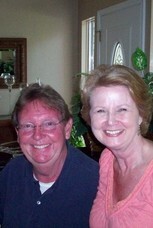 Darrell Barnes updated profile. View. Darrell Barnes has a birthday today. New comment added. Darrell Barnes posted a message on Tommy Weathers' Profile. Happy Birthday Tommy Weathers; my birthday is October 13th as well. Thanks for your friendship at Roswell Community College. You and Tom Randolph were great friends at RCC to a young man from RHS 1964. Peace and stay safe!!!!!!!!!!! !